While the idea of a flat Earth is not a new one, it has been recently resurrected into mainstream pop culture. For a variety of reasons, many have adopted this view, or have begun looking toward it as a viable option. For some, the arguments contrasting a spherical versus a flat Earth are confusing and have caused frustration. This frustration has then led to a sense of doubt towards many previously accepted beliefs and facts. Such doubt towards authority has even caused some Christians to question their faith in God’s Word. So what about humanity’s understanding for the shape of the Earth? Is the Earth spherical or flat? The best way to work through this discussion is to consider the observational evidences. One of the most definitive ways to directly see the spherical nature of Earth is through the images taken from space by various space agencies. However, because many people who hold to a flat Earth have also expressed concern about government conspiracy theories, we wish to present the space-based observations after we discuss some simple backyard-type observations. When considering new ideas, a bit of healthy caution is good, but can become unhealthy when conspiracy and paranoia consume the conversation over the facts and observations. Using the laws of nature and physics that God set in place, let’s investigate how we can know the Earth is, in fact, spherical. Between Flat-Earth and Globe models, the Sun and the Moon have drastic differences in physical characteristics and scale dimensions. The Sun’s generally accepted location places it toward the center of Earth’s orbit at a distance of approximately 93 million miles, with a physical diameter of 864,600 miles. In contrast, Flat-Earth models describe the Sun as being 32 miles in diameter and orbiting above the surface of the Earth at a height of approximately 3,000 miles.1 Since by observation the Sun and Moon have equivalent angular sizes,2 Flat-Earth models must also place the Moon in an orbit coinciding with the Sun’s orbit at a distance of 3,000 miles and having the same 32-mile diameter.3 Such scales for the Moon are vastly different than the Moon’s generally accepted location in space, where it orbits the Earth at a distance of 238,900 miles and has a physical diameter of 2,160 miles. We should also note that between these two views there is a vast contrast in distance between the positions of the Sun and Moon. In the Flat-Earth model the two objects share similar planes of orbit, circling above Earth parallel to the ground. Therefore, their physical distances from each other would fluctuate substantially depending on where in their orbits they were. At least once during every month’s cycle the two would be physically very near to each other. By contrast, the standard heliocentric and spherical context describes the Moon’s position in orbit around the Earth, where its distance from the Sun would keep approximately the same 93-million-mile-physical-distance as Earth. With such vast differences in scale these models must also describe vastly different physical characteristics for the Sun and Moon and, in fact, they do. Flat-Earth models describe the Sun and Moon in terms similar to spotlights moving above the Earth’s surface, illuminating in such a way as to produce periods of day and night. Resulting from this description, Flat-Earth models hold that the Moon is not reflecting the Sun’s light, but must instead be producing its own light. The physical characteristics of the Moon are therefore vastly different from the solid, rocky body and sunlight-reflecting surface usually discussed. One means of testing these contrasting parameters is by evaluating eclipse events, where the Sun, Moon, and Earth experience well-defined and observable changes. First, the most obvious type of eclipse is a solar eclipse. In this type of eclipse the observed effect is for the New Moon to pass in front of the Sun eclipsing some or all of our view of the solar body. Due to the Sun and Moon having similar apparent sizes in the sky, a total solar eclipse can occur when the Moon’s path precisely crosses the Sun. A total solar eclipse causes a daytime period of dramatic darkening, allowing the less bright outer regions of the Sun’s atmosphere, including the chromosphere and corona, to become visible to observers. While these portions of the Sun’s atmosphere are always producing light, their levels of emission are much less than the extremely bright photosphere. Solar eclipses do not usually result in the total eclipse orientation, but rather will occur more often as partial eclipses where only part of the Sun is obscured by the Moon. What information do eclipse observations provide? Eclipses demonstrate several important facts, which we will expand on below, including: (1) the apparent sizes of the Sun and Moon are approximately equal, (2) the distances from Earth to the Sun and Earth to the Moon are not equal, and (3) the spherical shape of Earth. Eclipses provide for us an important understanding about the positioning of the Sun, Moon, and Earth. We see from the fact that the Moon passes in front of the Sun that the two bodies must be at different distances. During a solar eclipse when the Moon obscures the Sun, the Moon’s distance is closer to Earth than the Sun’s. When we couple this with the first important fact mentioned, that the apparent sizes are approximately equal, then we are able to also understand that the Sun and Moon must be different in their true physical sizes. If two objects were the same true physical size, then placing one of them farther from you would cause it to appear smaller. Thus, since the Sun and Moon appear the same size, then the Sun (which is farther away) would have to be larger than the Moon (which is closer) in order to appear equal in size. As we consider a difference in distance between the more distant Sun and less distant Moon to be greater and greater, the necessary size of the Sun must be larger and larger to result in an observed equivalent, apparent size. Now that we have established they are not at the same distance, we can also explore how solar eclipses also help provide evidence for the distance factors of the Sun and Moon. A total solar eclipse occurs when the observer is located within the shadow cast by the Moon blocking the Sun’s light. Consider the shadow cast on a wall by placing an object in front of a light source. What happens to the shadow as the distance between the object and light source is decreased? The shadowed area becomes larger, and a viewer within the shadowed region would have to move farther to leave the shadowed area and lose this precise alignment. If the distance between the light source and object becomes larger, then the shadow that is cast on the wall will become smaller and subsequently the observer’s location in the shadow for an eclipse alignment must become more precise (i.e., since the shadow is smaller, there is less area located within the eclipse shadow region). Total solar eclipses are very rare events to see on Earth, which tells us that the alignment of such an event requires certain precision. It first requires precision for the orbits and locations of the three bodies to be exactly aligned. Second, it requires that an observer be located within the area of the Moon’s shadow cast on Earth. 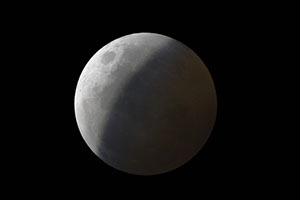 This second requirement increases the rarity of seeing a total solar eclipse, because the area of the Moon’s shadow resulting in totality is small, at most only about 165 miles in diameter.4 The casting of a small shadow means there must be a significant distance between the Sun and Moon. In addition, the path of totality, which is the track that the Moon’s shadow takes as it moves across the Earth’s surface, is a very narrow strip. When seeking to see a total solar eclipse event, the location where you go to observe must be very precisely chosen within the track. As we consider the shape of our own planet, we can gain perspective by making direct observations of other celestial objects. By comparison of the physical features we observe in other objects, we can make application to the features we observe on Earth. A good starting place is to consider the planets in our own Solar System, objects that are generally the easiest to observe: Mercury, Venus, Mars, Jupiter, Saturn, Uranus, and Neptune. Each of these planets is conventionally described as being spherically round, so let’s discuss the observational evidence. The planets Venus, Mars, Jupiter, and Saturn are the four easiest of the planets to observe with simple backyard telescopes or even binoculars. With these tools the casual observer can see that each of these objects has dimensions and shape, showing more than the spot of light seen with the naked eye. In a simple description, the planets are obviously round; but are they three-dimensionally round objects? During short times of observing, we are able to capture short picturesque views of the planets; but what happens as we continue our observations? If we simply make the effort to add repeated observations, we will be able to see the snapshot characteristics begin to show their dynamic and varying nature. With observations over a matter of days and weeks (even better over months), you will see Venus’ phase change, Mars’ apparent size and surface features change, Jupiter’s rotation, and Saturn’s ring orientation change. The next planet has captivated astronomers’ attention as far back as the telescope: the red planet Mars offers intriguing observations. In a similar fashion to his calculations of Jupiter’s rotation, Giovanni Cassini also calculated the length of Mars’ rotation by measuring how long it took for surface features to make it back around to the same spot. Both Cassini and Dutch astronomer Christiaan Huygens independently calculated the rotation period of Mars to be similar to Earth’s at just over 24-hours.9 The similarity between Earth and what we see when observing Mars is much more than just a similar period of rotation. 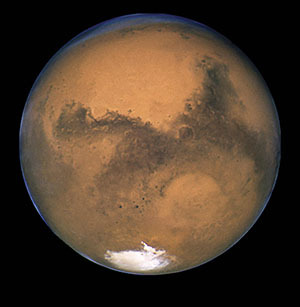 Mars has surface features such as large plains, expansive ravines, and elevated mountains. White regions aligned with its axis of rotation are similar to Earth’s icy polar regions. Mars also has varying atmospheric changes, which most notably include huge dust storms that can obscure large regions. As we consider a round, rotating planet with mountains and canyons, polar ice caps, and an atmosphere that at times is clear and other times is congested with dusty storms, we cannot help but think about days on Earth with beautiful sunny days and about camping excursions in quiet valleys, or maybe cloudy days that often bring sudden storms while hiking in the mountains. If Mars exists as a rotating, spherical planet with diverse landscapes, then so can Earth. One of the most recognizable planets, the ringed-world of Saturn, provides an interesting context to consider. With Saturn we find the geometries of both a flat disk for the rings and a spherical body for the planet. Saturn’s ring system is a collection of particles surrounding the planet, individually orbiting Saturn as evidenced from spectroscopic studies showing differential rotation of ring material.10 Even in commercially available telescopes, Saturn and its beautiful rings can be readily seen. However, as we make repeated observations from year to year, we can watch as the ring orientation changes in its tilt with respect to our perspective from Earth. In some years, Earth’s view is edge-on with Saturn’s ring plane, causing the rings to be barely visible, while other years, such as late 2017, the rings reach a tilt angle of 27° allowing the outermost A-ring to be visible in its full circumference. 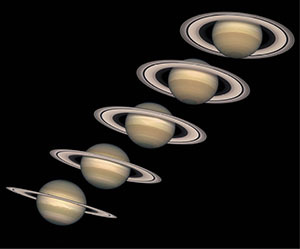 The changing tilt-angle of the rings is a regular cycle, oscillating in such a way that both the Northern and Southern Hemispheres of Saturn’s body will be directed towards Earth during the cycle. What this comparison provides is a single view contrasting a spherical versus flat geometry in space. If all of the planets were simply flat circles, then we should see the same type of drastic visual differences from their changing orientations that Saturn’s rings demonstrate, since Saturn’s rings are understood, even in the heliocentric model, to be approximately flat circles. Additionally, the fact that the ring-tilt observations are consistent for every observer on Earth shows that Saturn is a very distant object, so that even observers separated by great distances on Earth will have comparable views. The more distant planets of Uranus and Neptune are harder to observe with smaller amateur equipment. However, with diligence and larger telescopes, their round bodies can be observed in similar nature as the other planets. The fact that both Uranus and Neptune have their own systems of orbiting moons helps us to understand their relative size and gravitational dominance in their regions of space. The brightest of Uranus’ moons, Titania and Oberon, have been studied for well over 200 years. Titania, the largest and brightest moon, completes an orbit every 8.7 days, while Oberon takes 13.5 days.11 The largest moon of Neptune, Triton, has been observed for over 150 years and has an orbital period of 5.9 days.12 Thus, when we compare our observations of Uranus and Neptune to those of Jupiter and Saturn, we see many similarities and, by extension, can understand Uranus and Neptune as large spherical bodies. Simple observations of the Moon and Sun in the sky clearly show a circular body. Couple this simple observational fact with a few additional observations and we can understand them as three-dimensionally round, as well. For instance, in similar fashion to some of the planets, the Sun can easily be monitored over several days tracking visible photosphere features called sunspots, progressing across its surface. Sunspots are dark areas in the brightly visible layer of the Sun, called the photosphere. As we track a sunspot feature across the Sun’s apparent surface, we find that shape and orientation of their entire context shows its movement to be caused by the Sun’s overall rotation and not large atmospheric motion. Even small backyard telescopes with proper solar filters can be used to monitor the presence and movement of sunspots. For the second brightest object in the sky, the Moon, our regular observations can be done even easier than trying to safely view the Sun. The most obvious observation of the Moon is that it progresses through a regular cycle of phases each month. As this cycle occurs, there is an obvious curvature seen in the visibly bright portion of the Moon. The shape of the Moon’s phase, defined by the dark and light regions, is not caused by any shadowing from Earth. Instead, the obvious curved shapes of a Gibbous or Crescent Moon are due to the overall spherical curvature of the Moon itself. As the Moon’s position relative to the Sun’s location changes, our view of the Moon’s sunlit portion changes, and we see the side of the Moon facing away from the Sun. The direct relationship between lunar phases and the Sun can be seen by how each phase corresponds with the Sun’s position, noting also that the phase of the Moon is approximately the same for every observer—evidence for the Moon having a large distance from Earth. Flat-Earth models have the Moon located quite close, and as such, the Moon’s phase would be dramatically different based on where the observer is located. Instead, a Full Moon is always found opposite the Sun in the sky for every observer. When the Sun is setting below the horizon, the Full Moon is rising above the horizon, and when the Full Moon is setting, the Sun will be rising. Conversely, when the lunar phase is a New Moon, both the Sun and Moon will be seen in the same direction. The sunlit portions and the oppositely shadowed regions of the Moon are the visible results of the spherical shape of the Moon. Even further, as we gaze at the Full Moon, its varying surface features are obvious by the contrasting light and dark regions. Employ binoculars or a small telescope and you will have immediate access to a wealth of topographic variation: rough and smooth areas, large and small craters, elevated peaks and depressions. Focusing on the surface features, we find that the shadowing effect that the phases provide enhances our understanding of the three-dimensional aspect of the Moon. The boundary line produced by the curved shadow across the Moon’s surface (during the Gibbous or Crescent phase) is called the terminator. You will find as you observe the Moon that the terminator is a region of excellent viewing. “Why?,” you might ask. There is a subtle decrease in the brightness of this region, allowing it to be somewhat easier on the eyes. The brightness difference is caused by the fact that the shadows of visible features along the terminator become lengthened as the terminator line approaches them. First, this is one piece of evidence toward the Moon not producing its own light, as some Flat-Earth proponents suggest,13 but rather reflecting light from an outside source (the Sun). Second, the shadows become extended when features are near the terminator, showing to a greater degree a contrast in height above the lunar surface. Here we can begin to identify the differences between elevated and depressed features by where their shadow is cast. The Moon is a distant, three-dimensional body with a variety of topographic landscapes. As we view the night sky and trace out familiar patterns in the stars, we can begin to map out the constellations. It is these consistent arrangements of stars that allow us to map and chart the heavens. 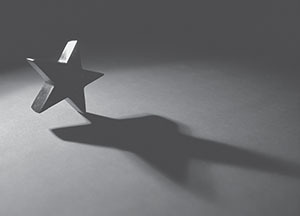 We can use the positions of constellations relative to other stars and constellations to help us determine, not only where lesser-known and less-obvious celestial objects are located, but to help us on Earth to navigate our own geography. Similar to how Earth’s geography has been mapped through history to provide our current knowledge of how the major landforms are oriented, the entire sky has likewise been mapped to give us a relation for how each constellation is oriented and located relative to the others. Following the same process for how Earth’s maps were compiled, requiring not only exploration but a combining of knowledge from many diverse groups across the world, the constellation map of the sky has been compiled from astronomical observers from different regions of the Earth over long periods of time. This process of combination was not only a good arrangement but was necessary for a complete map, since the available view of the sky is dependent on your location on Earth. Observers in different locations will have different views, not only for similar times of night or seasons, but also may have access to view constellations not available to other regions. First, the view of a single observer varies seasonally. The visible constellations follow a regular cycle throughout the period of a year, and then repeat the same exact cycle the next year, and every year after that. What this seasonal cycle illustrates is that for any single location, there will be constellations that can be viewed during the winter months but that are not visible during the summer months, and vice-versa. This variation means that the Sun’s position in the sky is independent of the star and constellation positions, and thus there must be two motions in process to account for the Sun’s position and the constellation positions. The fact that there are seasonal variations seen in the East to West changing of visible constellation positions supports the spherical curvature of Earth and its rotational axis motion that impacts the star’s positions. Second, there are constellation variations based not only on seasonal changes but on the geographical locations of observers. If we consider different observers located in the midwest United States, in central Africa, and in Australia, we find that each will have dramatically different observations. The set of constellations visible will be very different for locations with large North-to-South separations, where many constellations will not be visible from the opposite location. Constellations that may be visible from two locations with smaller North-to-South separations will still have very different apparent positions in the sky. Thus the stars and constellations visible at a particular location correspond directly to an observer’s latitude, where observers located at dramatically different latitudes will have unique views. These variations show us that there is a North-to-South curvature of Earth, which is aligned with a preferred axis of East-to-West rotation. A Flat-Earth model is not able to describe these observations, where a spherical Earth provides a simple description for how they occur. These observable facts make clear sense for a spherical Earth, as the relative positions on the globe would determine your outward facing view of the sky. Other regions of the sky are obscured by the curved body of Earth. The reason that some constellations may be completely unique based on your location, results from Earth’s globe having a rotating motion about its axis. Where an observer is located on the surface, relative to the axis of rotation, will define what regions of the sky may or may not be visible and which stars are circumpolar (meaning they circle the celestial pole and are continuously above the horizon). The nearer you are to one of Earth’s poles (North or South), the less of the total sky you are able to see. A person South of the Equator will never see the North Star, Polaris (located at the North Celestial Pole). A person North of the equator at latitudes greater than about 26 degrees will never see the Southern Cross (near the South Celestial Pole).14 This location-dependent view is why Australia and New Zealand have this prominent group of stars on their nation’s flags, but Northern Hemisphere nations do not. Flat-Earth models have huge complications when trying to describe how the visibility of constellations varies based only on an observer’s latitude. Problems are further compounded when addressing the observations of completely different constellations visible to those located at far Northern and far Southern latitudes, and that there are not one but two celestial poles around which stars rotate. 1 Eric Dubay (2014), The Flat–Earth Conspiracy (Self-published), p. 89; See the phrase “under 4,000 miles” in Samuel Rowbotham (“Parallax”) (1865), Zetetic Astronomy: Earth Not a Globe! (Bath: S. Hayward), p. 74. 2 Both the Sun and Moon have an angular size of 0.5 degrees. “Angular size” measures how large in angular units, such as degrees, an object appears. Angular size is not a measure of the true physical size, but rather an apparent size based on the object’s distance. 3 See “The Moon” at the Flat Earth Society Web site: http://www.theflatearthsociety.org/tiki/tiki-index.php?page=The+Moon. 4 http://www.astronomy.ohio-state.edu/~pogge/Ast161/Unit2/eclipses.html. The August 21, 2017 total solar eclipse will only be about 70 miles in diameter, as measured from the NASA map projections. See https://eclipse2017.nasa.gov/sites/default/files/interactive_map/index.html. 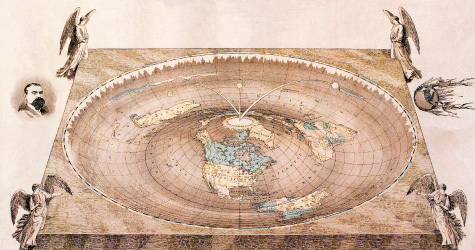 5 “The Flat Earth Society, along with previous notable flatists such as Samuel Shenton and S. Rowbotham, believe there is no end to the Earth and that it continues indefinitely. The only edge to the earth is the one you are standing on.” Seehttps://theflatearthsociety.org/home/index.php/faq#173818. 6 See the flat Earth map on the cover of this issue of R&R created by Orlando Ferguson in 1893. Also at https://commons.wikimedia.org/wiki/File:Orlando-Ferguson-flat-earth-map.jpg. 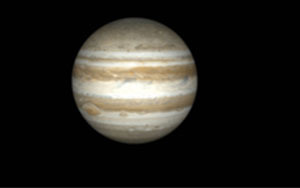 7 Thomas Hockey (1999), Galileo’s Planet: Observing Jupiter Before Photography (Bristol, PA: IOP Publishing), pp. 31-32; C.A. Young (1886), “Rotation Time of the Red Spot on Jupiter,” The Sidereal Messenger, 5:289-293, http://adsabs.harvard.edu/abs/1886SidM....5..289Y. 8 C.A. Higgins, T.D. Carr, and F. Reyes (1996), “A New Determination of Jupiter’s Radio Rotation Period,” Geophysical Research Letters, 23:2653-2656. 9 “All About Mars” (no date), NASA, https://mars.nasa.gov/allaboutmars/mystique/history/1600/; Jim Plaxco (1999), Mars Timeline of Discovery: 1570 BC thru 1799, http://www.astrodigital.org/mars/timeline1.html. 10 Helen Sawyer Hogg (1963), “Out of Old Books: James Keeler and the Rings of Saturn,” Journal of the Royal Astronomical Society of Canada, 57:269, http://adsabs.harvard.edu/abs/1963JRASC..57..269S. 11 David Williams (2016), “Uranian Satellite Fact Sheet” (Greenbelt, MD: NASA Goddard Space Flight Center), https://nssdc.gsfc.nasa.gov/planetary/factsheet/uraniansatfact.html. 12 David Williams (2016), “Neptunian Satellite Fact Sheet” (Greenbelt, MD: NASA Goddard Space Flight Center), https://nssdc.gsfc.nasa.gov/planetary/factsheet/neptuniansatfact.html. 14 Bruce McClure (2017), “Northerners’ Guide to Southern Cross,” EarthSky, http://earthsky.org/favorite-star-patterns/the-southern-cross-signpost-of-southern-skies.